Mr. Bhuvanagiri Chandrasekhar, FPM Industry Batch 2016 participant has recently won the Outstanding Business Performance Award 2018 from the Ministry on January 30, 2019. He received this award on the behalf of Telangana Circle of India Post from Sri Piyush Goyal, Honourable Minister of Finance, Railways, Coal and Corporate Affairs and Sri Manoj Sinha, Honourable Minister of State for Communications (I/C) and Minister of State for Railways in an award ceremony held at New Delhi. The India Post Payments Bank (IPPB) was launched on September 01, 2018 by the Honourable Prime Minister of India. Thereafter an All India Competition is organized to award the best performing Circles (States). For the competition, circles were categorized into 4 groups based on their size. In each category, top 2 circles were awarded. Mr. Chandrasekhar noted that the employees (6,000+) are required to pick up the skills of Payments Bank operations and to perform in the field. ‘I took the lead and organized training interventions across the state to enhance the competency of the Trainers and to ensure highest learning and skill acquisition for the employee trainees during the work related training programs’, he said. Ensuring the support and encouragement to the employees to transfer these learnings on to their job, and to give their best performance—turned out to be their USP. 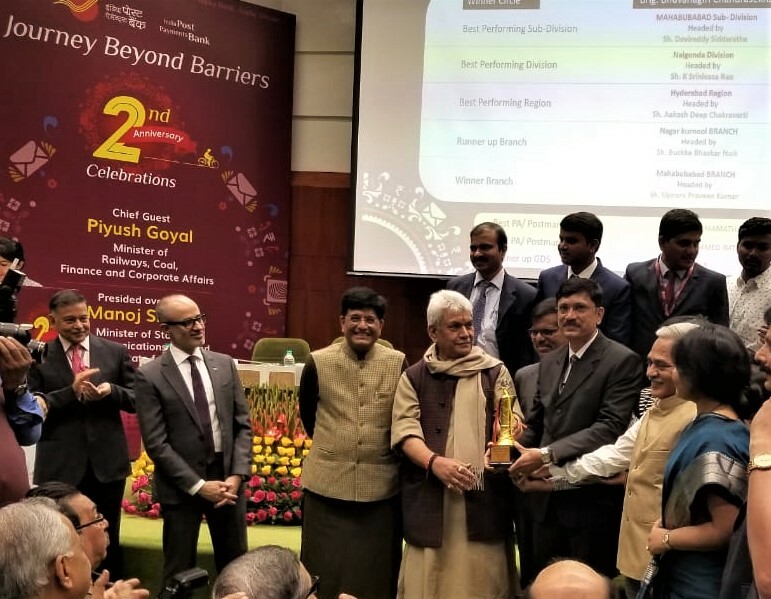 He received the award in the presence of Shri Anant Narayan Nanda, Secretary, Department of Posts and Smt Meera Handa, Director General (Posts) along with all the members of Postal Service Board, CEO and Senior Officers of IPPB and all Chief Post Masters General of 23 Post Circles. IIM Indore congratulates Mr. Chandrasekhar for his achievement.